Eight Information-packed Hours on CD!! More than ever, the demands on today’s woman make it vital that she not only maintain, but maximize her personal health and energy. Preview audio samples from each CD program below. ORDER “TODAY’S HEALTHY WOMAN” AND RECEIVE YOUR CHOICE OF ONE OF DAVID’S OTHER PRODUCTS FOR FREE IMPORTANT: BE SURE TO SELECT YOUR FREE PRODUCT (ADD TO CART) BEFORE HITTING THE ADD TO CART BUTTON FOR TODAY’S HEALTHY WOMAN. Career Woman, Wife, Mother, Homemaker, Taxi Driver… More than ever, the demands on today’s woman make it vital that she not only maintain, but maximize her personal health and energy. 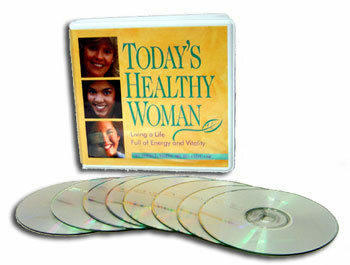 "Today’s Healthy Woman" provides real-world, practical and scientifically-based information that really works. Career woman, wife, mother, homemaker, and taxi driver. The demands on today’s woman make it vital that you maximize your personal health. Here’s the latest on why you shouldn’t eat like your husband. Join in on all the fun and laughter as David presents his program "Today’s Healthy Woman" before a live audience. Click the play button below to listen to an audio snippet from this track. Are carbohydrates the problem? Or is it fat? Does the Atkins diet really work? Long-term? Or is it just calories? How can you make sense of it all? Here’s the bottom-line, what you got-to-know, gospel-truth about how to lose weight and keep it off. Click the play button below to listen to an audio snippet from this track. A woman who carries her extra fat around her waist is much more likely to suffer from health problems than a woman who carries the same amount of fat around her hips. Speaking of cellulite, here’s what you can do about it without cremes, lotions, or potions. Plus, the secrets of people who keep weight off. Click the play button below to listen to an audio snippet from this track. Teenager, mother, and grandmother. The different stages of a woman’s life all have unique health challenges and opportunities. Here’s an overview of your changing nutritional needs as you go through life. Click the play button below to listen to an audio snippet from this track. Only one in twenty-five American women die from breast cancer. But one in two women will die from cardiovascular disease. A woman is 50 percent more attack than her husband is. Many women don’t even experienced the classic signs of a heart attack when they’re having one. Here’s a list of risk factors and what you as a woman can do about each one. Click the play button below to listen to an audio snippet from this track. It’s a well-established fact that women outlive men. Men lead women in twelve of the top 15 causes of death in the United States. He needs your help. You’ll learn how to decrease his risk of prostate cancer and why he should eat more ketchup. Simple suggestions to help the man in your life live longer and better. Click the play button below to listen to an audio snippet from this track. The average child today weighs 15 pounds more than their counterpart did thirty years ago. They eat too much salt and their cholesterol, on average, is borderline high as well. Kids won’t eat brussels sprouts because most of their parents won’t either. Here’s how to improve the nutritional quality of foods kids will eat. Click the play button below to listen to an audio snippet from this track. You’re probably not eating enough. Fiber, that is. You’re Grandma called it roughage, and you probably get less than she did. Not only does fiber help with digestion, it can decrease your risk of heart disease and cancer as well. How to eat beans and still have a social life. Click the play button below to listen to an audio snippet from this track. If there ever were Magic Beans, it’s soy! Soy milk, soy burgers, and soy ice cream; has the whole world gone soy nuts? Is it all hope or hype? The exciting new information on the benefits of putting more soy in your day. Click the play button below to listen to an audio snippet from this track. One out of four women who breaks a hip is dead within twelve months! Find out if you’re at risk for the brittle bone disease. Learn what exercises are best for your bones and discover the richest sources of calcium, vitamin D, and magnesium. Click the play button below to listen to an audio snippet from this track. What you don’t know about calcium supplements. Foods that work against calcium absorption, the truth about kidney stones, bone density tests, and why you should stop taking hormone replacement therapy. Plus, the new medicine that actually builds bone. Click the play button below to listen to an audio snippet from this track. The reality is that most women will never get breast cancer and the majority of those who do get it, survive it. Nevertheless, it remains the number one health fear of women today. Here’s the specific steps you can take to decrease your risk. Plus, information on the latest medications that can lower your risk even more. Click the play button below to listen to an audio snippet from this track. Are you cold all the time? Do you fight with your husband over the thermostat? The No. 1 nutritional deficiency of women in their reproductive years in the United States is iron. But it’s not easy to get. Many women can feel the effects of border-line anemia even when blood tests reveal no problem. Here’s what you can do to feel your best every day. Click the play button below to listen to an audio snippet from this track. It’s not what you eat between Christmas and New Years that matters, it’s what you eat between New Year’s and Christmas! Nevertheless, the choices you make over the holidays can make it hard to fill those New Year’s resolutions. Here’s practical ideas on how to enjoy healthier holidays. Click the play button below to listen to an audio snippet from this track. Give Me The Chocolate… And No One Gets Hurt! Hershey’s makes 20 million kisses a day. You say you only eat half that many? New research shows that chocolate contains good antioxidants. So is chocolate a health food? Plus, how what you eat can help you have great looking skin. Click the play button below to listen to an audio snippet from this track.